This plaster based heat resistant material has a quartz’s allotropic shape in it’s composition which achieves a maximum precision in low melting point metals and alloys castings made by the “lost wax” procedure if the melting point is not over 800°C. 150 Kg/cm2 after hr of setting (hardening) and using a rate of 35 cc water with 100 g powder. The setting expansion for this investment is around 0.6% linear and thermal expansion at 700°C is 0.9% linear. The total expansion is 1.5%, which gives greater precision in the pour that contracts approx 1.5% linear (in a general way in gold alloys). 60 micron which garantee great detail and smoothness in metal castings. 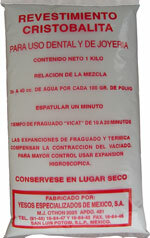 Plastic can with hermetic seal containing 25 Kg packed in 1 Kg polyethylene bags. Card box containing 10 Kg packed in 1 Kg polyethylene bags. It is made in white. Used to pour low melting point metals (gold, aluminum, etc. 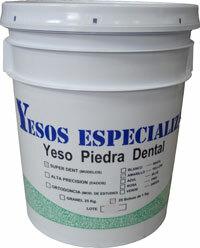 ), dental use, jewelry, shoes industry, galas industry, automotive industry, etc.